When I have been traveling in Spain, you have been receiving my email letters a couple of times a week. You have encouraged me and shared with me how much you have enjoyed my stories of Spain, its sites, food and people. I will be returning to Spain in mid-October; this time I will be blogging. This will allow me send photos and even short videos as I make my way around this beautiful country. Today, I am getting started, practicing before I head off. And, finally, I will be getting around to sharing some of my photos from my spring trip there. I would like to thank two neighbourhood friends for helping me get set up. One is sitting not too far away at this point in case I get in trouble. This is the traditional folk dance of Catalonia, a simple circle dance, simple steps making it easy to learn and even easier to join when the dance is in progress in the village square. It is always accompanied by a live band of village musicians. 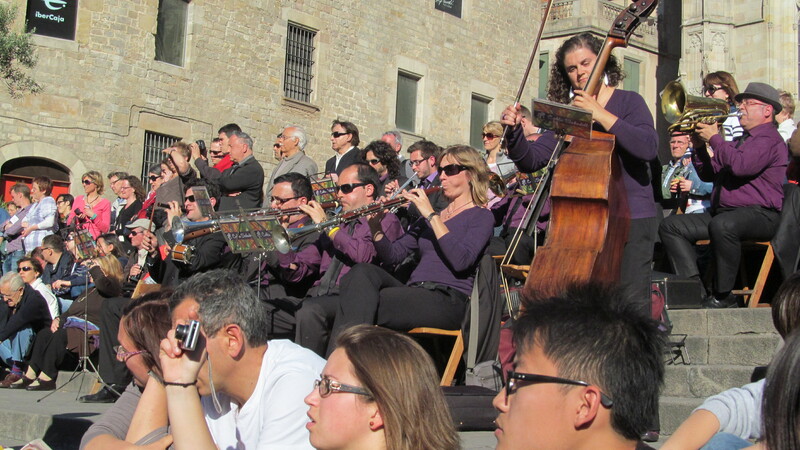 The usual brass instruments are included, a double bass, and a local variant of the clarinet/oboe family. The leader plays a piccolo and wears on his elbow a small drum to set and keep the tempo. The movements are very relaxed for the most part but the music itself is quite lively. 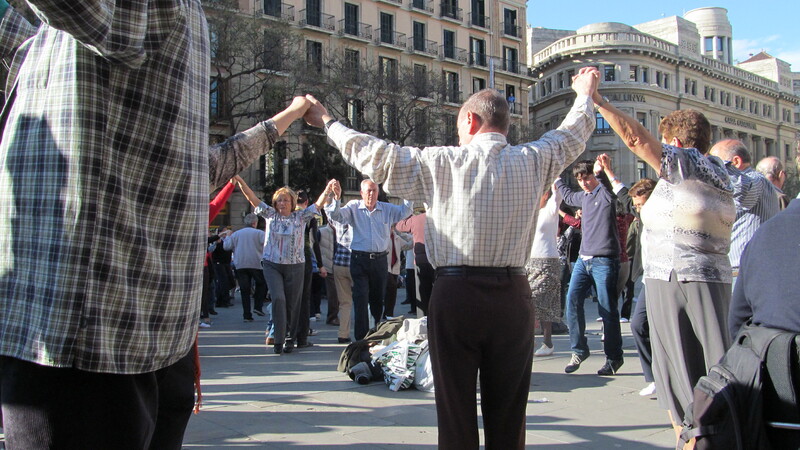 Over the last century or so, this dance has become closely linked the the independence movement in Catalonia. We are in the large plaza in front of the Gothic cathedral in Barcelona. A Sunday afternoon, the band is set up on the steps of the cathedral waiting from the people of Barcelona to show up, stack their backpacks and purses in the centre, form the circle and begin dancing. The lad with the piccolo and elbow drum can be seen just behind the end of the further of the two horns. 20 degree weather, an appreciative audience from all corners of the world, another day that reminds me how much I simply enjoy being there for a period of time. I will be back in a few days to show you some amazing sculptures celebrating this dance. Good morning, Rajé, although you should be sleeping soundly. Enjoy those weekend mornings at the Grounds. Regardless of all the wonders of Spain, I do miss filtered coffee and choice! It is all basically the same here, out of the machine, from coffee out of little vacuum packages from the factory.